Personal fitness is important, and joining gyms or fitness centers can be a key to better health. But when deciding to join a health club, it's important to make the right choice. Washington's health club law (RCW 19.142) covers most clubs. Below are some tips to consider from the Washington State Attorney General's Office. Any money you pay must be put in a trust account or the club must carry a bond. If the club doesn't open on the specific date, you are entitled to a refund and can cancel within the first five business days the facility is open. 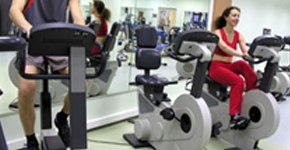 The health club must provide a written list of all membership plans, including the description and price of each. Special offers and discount prices must be in writing. Information about the length of the contract; clubs cannot sell "lifetime memberships;"
Information about your cancellation rights. Before signing a contract, visit the club during the hours you expect to use the facility. Peak hours might reveal more people competing for equipment than anticipated. After you have properly cancelled your membership, you are under no obligation to continue making contract payments. However, you may still be obligated to pay the initiation fee after canceling the membership if you financed the initiation fee and signed a non-refundable clause. Closing without warning, and in some cases, continuing to sell long-term memberships until they go out of business. Within three (3) days after signing a contract, you can cancel your membership for any reason. Cancellations must be in writing, and after receiving your written cancellation notice, the club has 30 days to refund your money. At any time during your membership, if your contract runs for more than a year, you can cancel by giving 30 days written notice. If your contract is later than one year, and you move more than 25 miles from the health club, you can cancel if no affiliated club within 25 miles of your new residence offers the same services at no additional charge. If the health club closes permanently, and the owner does not have a comparable facility within 10 miles of the club, you can cancel and receive a pro-rated refund of your initiation fee. If equipment or services which were promised in the contract are not completed by the date specified in the contract are not completed by the date of the contract, you are entitled to a full refund of your membership fee. A health club cannot legally ask you to give up any of your rights under this law. Violations of the Health Club statute should be reported to the Consumer Protection Division by filing a consumer complaint online or through the mail. For more information, visit www.atg.wa.gov/file-complaint. If you take a health club to court over violations of the law and you win, the health club will be required to pay for your attorney and court costs.